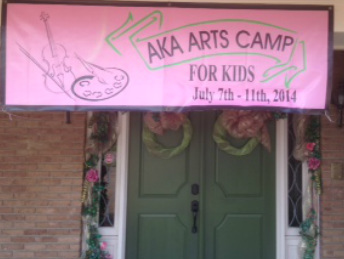 Gamma Eta Omega Chapter of Alpha Kappa Alpha Sorority Inc. has sponsored the ARTS CAMP FOR KIDS for 19 years. 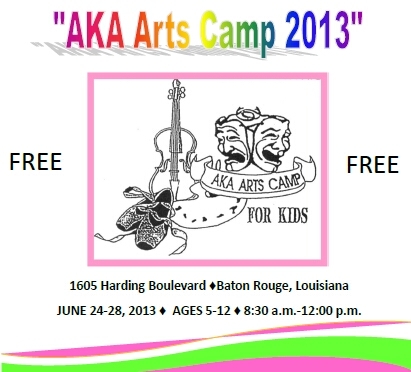 The free camp is for 5 to 12 year old children from throughout the Baton Rouge Community. It is held at the sorority house located at 1605 Harding Blvd. Lunch is provided daily along with snacks! We provide children with exposure to the arts through music, mixed media projects, painting projects and more! All being led by local artists! The 2015 Gamma Eta Omega's "Art Camp for Kids" was held July 6-10, 2015 from 8:00 am - 12:00 pm daily. 2015 Art Camp included jewelry making, more dancing and a bongo class taught by "THE" master poet and musician Mr. Chancelier Skidmore! Special thank you to all of our volunteers! The children of our community are benefiting greatly from their exposure to the arts! Last day of Gamma Eta Omega's "Arts Camp for Kids" was perfect! Zydeco legend, Mr. Mel Chavis, stopped by to give a lesson in Cajun music and needless to say, a second line happened! Lol! Special Thank you to everyone who made this activity wonderful! In addition, participants engaged in a variety of craft activities designed by members of the chapter. A total of 64 children participated. They were provided morning snacks and lunch. Forty sorors volunteered more than 500 hours of service to make this a success.